Lambics are some what of an interesting style, mostly because of the funk taste but also the nature of the open air fermentation. Back in Belgium, back in the the old days, brewers would leave their vats of beer open and whatever floated by would settle into the beer. The region in Belgium famous for lambics was lucky enough to have some very special yeast floating through the air that gave it this distinctive funk. Of course they didn’t know about yeast and all that back then. Today those special stains of yeast are added in instead of letting them float on by, at least I hope they are. The other qualification for a lambic is a 30% wheat grain bill. Then they are often aged in barrels before bottling once in the bottle they receive a secondary fermentation to keep them going for years to come! In fact the owners of Rivertown, Jason Roeper and Randy Schiltz, were home brewing lambic style beers for many years before starting RTB. One of Jason’s home brewed Lambic style beers won the Sam Adams Long Shot competition in 2009 (Boston Beer Company now owns that specific recipe) but the current one is very close. Once the brewery got up and running they made it a priority to keep the lambics rolling and have been releasing a yearly batch ever since. On top of that they’ve expanded their sours to include an old sour cherry porter, Ojos negros (a wild ale), and a gueuze (a blending of 2 vintages of lambic). Nice hazy amber brown color that revels a hint of gold when held up to light, actually quite a pretty brew. I didn’t get any head even off of a more aggressive pour. There were initially quite a few bubbles but they popped away quickly. The wild, barn yard-esk, smell pairs well with this lipizzaner stallion thing that happens to be on PBS tonight. There are quite a few other small things I’m picking up like some kind of wood, I think it’s oak that they age it in, and of course some sourness. The first sip of any sour always reminds me of Vincent Price’s line from Thriller “the funk of 40,000 years” which is, in my opinion, an almost perfect way to describe many sours. Though in this case it’s just the funk of 1 year, because that’s how long it was aged. Plenty of tart sourness that throws your tongue for a loop and makes your head shutter a bit. There is more of that oak wood flavor as well as some bread action and lemon zest. The body is on the light side of medium and there is light carbonation. One quick note on the label, if you notice it says 2012 on there, but wait… this just came out and it’s 2013, what’s the deal?? Well this beer was brewed in 2012, stashed in oak barrels to age, then bottled and distributed in 2013. I don’t love sours but I do really enjoy shaking up my palate with one of these every once in a while and I can fully appreciate the styles. Sadly many can’t and I hope that changes, it certainly seems to be changing across the craft beer scene. Sours are becoming more popular and produced more often across the country. The sweet thing about having Rivertown make so many nice sours is that they’re easy to get for us, this is currently available at the brewery and is, or will be soon, at stores around town. 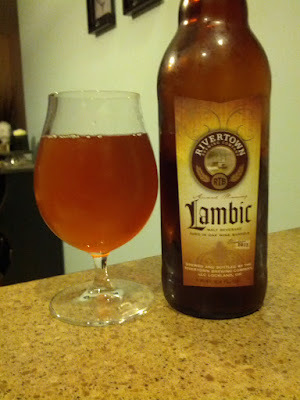 Another great thing with Rivertown in town is that sours age fantastically, so without further delay I present today’s review of last year’s lambic! Pours a curious combo of orange brown and a bit of yellow, kind of like dark honey. Again very hazy but this time around it started with a nice white head but that quickly faded into a ring of tiny bubbles around the edge of the glass. Picking up more citrus along with that barnyard, funk, and bread. Like eating a fresh biscuit while riding a horse in an orange grove. Far less of that tart sour kick it to the palate like before. The year in the bottle has really mellowed this out. Still plenty of funky sour flavor along with some lemon citrus, and malt biscuit action. Plenty of carbonation tickles my tongue while the medium body slides across it. This is a much more preferable brew to me. Plenty of that funk but none of that initial shock as it hits your lip. Aging is really very beneficial to this beer and I strongly encourage folks to pick up at least 2 bottles, 1 for now and 1 for the cellar. Also may want to pick up 1 to trade. Now you may be saying “dang, I didn’t think ahead last year and didn’t buy 1 to agree. Woe is me!” luckily for you Belmont Party Supply in the Dayton planned ahead for just such an event last year and still have plenty of the 2011 left, hence the ugly vintage 2011 sticker on the bottle shown. 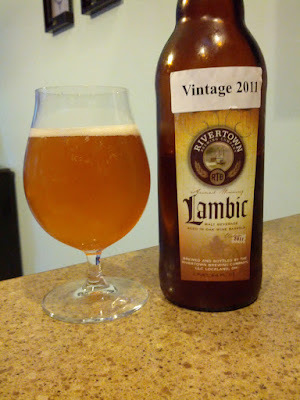 And if you want to go back even farther here is Josh’s review of Rivertown’s 2010 Lambic. I’d like to try one of those today to see what 3 years has done to it! Many thanks to Randy Schiltz for helping me out with some facts, oh and for brewing this beer! “Today those special stains of yeast are added in instead of letting them float on by, at least I hope they are.” They are not. Traditional lambic producers in Belgium still use open spontaneous fermentation, and not cultured yeasts. Why would you want otherwise?